Border Agency Chief Opens Up About Deadly Force Cases Gil Kerlikowske, head of Customs and Border Protection, tells NPR that he is reviewing scores of incidents. "We need to be better at admitting when we're wrong or where we've made a mistake," he says. 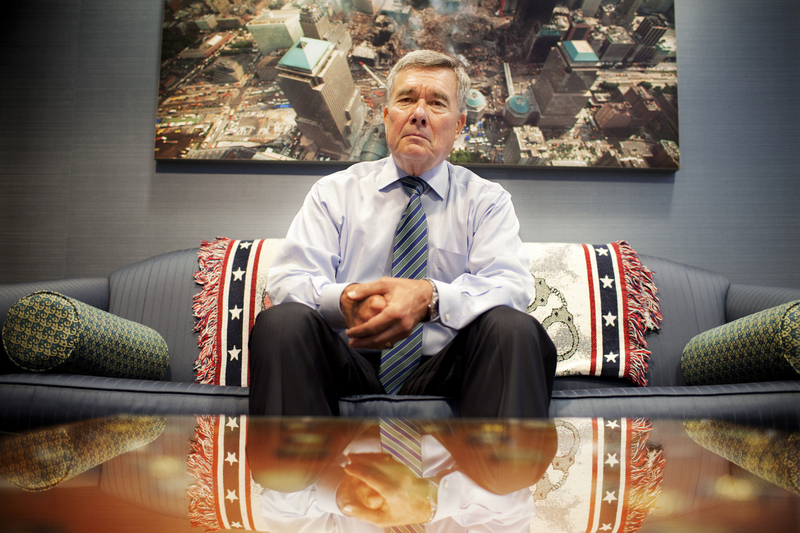 U.S. Customs and Border Protection Commissioner R. Gil Kerlikowske sits under an image of New York's Ground Zero in his office in Washington. For him, it serves as a daily reminder of the security threats that have shaped his agency. Kerlikowske says his newly appointed deputy in charge of internal affairs "currently has a process to review" all 67 uses of deadly force listed in a report commissioned by the agency. He also pledged a review of other cases highlighted by NPR News, including a 2010 killing of a Mexican teenager — a shooting the agency said was justified. "I can promise you on these cases involving force and the reviews that are going on that we will be following through," Kerlikowske says. "I'll be examining these with a group of people here in CBP, leadership within the Border Patrol and others that are just as absolutely concerned as I am at getting things resolved. "This has built up over quite a bit of time," he adds, "and it's going to take a little time to resolve it." Kerlikowske has made a priority of opening up an agency that is famous — some would say notorious — for its reluctance to provide information to the public. "Frankly, we need to be better at admitting when we're wrong or where we've made a mistake," he says. "There is a certain sense in law enforcement that if we just keep our heads down, all of this will go away — meaning media scrutiny and nongovernmental organizations. That doesn't happen." I can promise you on these cases involving force and the reviews that are going on that we will be following through. Kerlikowske was appointed by President Obama and was confirmed by the Senate in March. Upon moving into his new office in Washington, he chose to leave up decorations that a predecessor had hung on the walls: four huge aerial photos of New York's ground zero after the Sept. 11, 2001, attacks. The photos are vivid reminders of pressure the Border Patrol faces in securing the U.S. frontier. Now, Kerlikowske's portfolio includes the agents who guard thousands of miles of frontier, across deserts, mountains and cities. He knows well that some people along the U.S.-Mexico border might wish they could be guarded from the Border Patrol. In several recent reports, NPR has detailed the most controversial shootings. In 2012, a Mexican teenager was shot multiple times through a border fence in Nogales, Ariz. An autopsy says most of the bullets struck him in the back. Federal authorities have yet to say if the shooting was right or wrong. Also that year, a Mexican man in a riverside park in Nuevo Laredo, Mexico, was shot by an agent aboard a Border Patrol boat on the Rio Grande. Again, the government has yet to rule on the shooting. Kerlikowske told NPR that extended silences are "not acceptable," though border investigations can be complex when they involve multiple agencies. "There's no reason that within 24 hours a senior member of the Border Patrol can't give a fairly detailed description to the best of their knowledge of what occurred," he says. His internal affairs division is working on implementing such a rule, which he had previously imposed in Seattle. The commissioner suggests his agency expanded too quickly after the Sept. 11 attacks, when it nearly doubled to a roster of more than 20,000 agents. "The money was provided, people were hired very quickly, and at times that can cause difficulties, as we know from other agencies across the country," he says. Now he wishes to expose the agency's flaws as well as strengths to public view. He says the Border Patrol is experimenting with body-mounted cameras that would record encounters with civilians. He expects this will be one of several reforms that will hold agents accountable — or exonerate them — as they have in some municipal police departments. Some Border Patrol shootings have already been caught on video, such as a 2010 killing on the border at El Paso, Texas. An agent shot 15-year-old Sergio Adrian Hernandez Guereca, who stood just across the border in Juarez, Mexico. The Border Patrol said the agent was threatened by rock throwers, though both the video and the agent's initial report showed Guereca standing up to 75 feet away. This case recently returned to the news when a federal appeals court said Guereca's family can sue the agency. The federal government had previously claimed the family could not sue because Guereca was standing on Mexican soil. Kerlikowske expressed concern about a "chilling effect" from the ruling, and that it may be overturned on appeal. NPR had previously interviewed the teenager's mother, Maria Guereca of Juarez. When we met the commissioner, we posed a question from Guereca: "I would like to know if you're going to help us with our case, if you're going to follow through." "We will be following through," Kerlikowske answered. "And I would promise you that I would — or I would promise her — that I would certainly see the results of those cases made more open and more visible."